Renee Muller was born and bred near Lake Lugano in Switzerland, where she grew up eating—and learning to cook—according to Northern Italian tastes and traditions. Only in this old-word, magical environs can you imagine a young adulthood that included Friday afternoons sipping espresso in a piazza, knowing that the Shabbat meal was already prepped and these last remaining hours before sundown were best spent savoring life—and rich coffee. Now living in New Jersey with her husband and children, and having created a career as a top Jewish food stylist, Muller is out with her first cookbook, the kosher Our Table: Time-Tested Recipes, Memorable Meals . 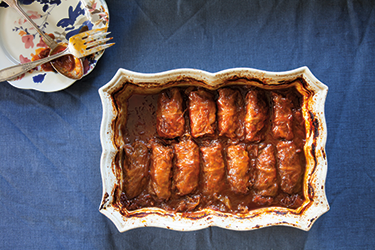 Here are two standout recipes (one breakfast, one dessert) that work perfectly for Rosh Hashanah, plus stuffed cabbage, a great option for Sukkot. Prepare the apples: In a saucepan, melt butter over a medium-low flame. Add apples (peeled or unpeeled, according to taste), sugar and cinnamon; cook until apples are fragrant and soften a bit, about 15 minutes. Set aside to cool. 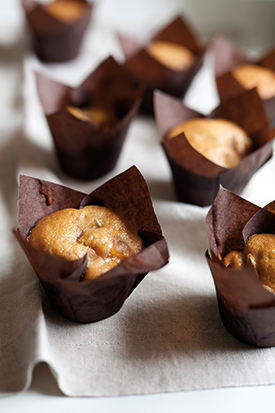 Prepare the muffins: In the bowl of a stand mixer, on medium speed, combine tea, sugar, oil, honey and eggs. Mix until smooth. Reduce speed; gradually add flour, baking powder, baking soda and cinnamon. Scrape down sides of bowl as needed. Place brown sugar, flour and margarine into a second bowl. Using your fingers, combine them, forming crumbs (some of the crumbs should be pea-sized). 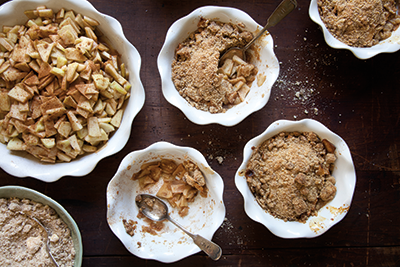 Scatter crumbs over apples. Bake, uncovered, for 45-50 minutes, depending on size of your dish. Cobbler is ready when edges begin to caramelize and crumbs are becoming brown. Store at room temperature; serve, preferably, warm. Note from Renee Muller: I usually prepare this apple cobbler in advance and freeze it before baking. When I need one, I just remove it from the freezer and bake it for a little longer than the recipe instructs. Another great trick is to double the crumb mix and freeze the excess in a resealable plastic bag. This way, I only need to slice a few apples and I’m all set to make a fresh cobbler. As soon as you decide you might want to cook some stuffed cabbage, stick those cabbages into the freezer. The longer they sit in there, the better. Ideally, they should freeze for at least a week. This is the preferred method for peeling those leaves without breaking them. The freezing process softens the leaves, almost like cooking them, without the mess of the hot water and pot. Remove cabbages from freezer and let defrost in large bowls or in a colander in the sink, as they will emit lots of liquid. This might take a good few hours. Be patient. Prepare the filling: Heat oil in a large saucepan over low heat. Add 3 onions and garlic. Cook over low heat until soft and translucent, stirring from time to time. Add rice, 1/2 cup oil, paprika, sugar, chicken soup mix and black pepper. Mix to combine. Remove from heat; let cool. Add meat and eggs to cooled mixture. Mix well to combine. Your filling is now ready. Set out 3 (9 x 13-inch) roasting pans. Carefully, so that the softened leaves don’t rip, peel cabbage leaves from the heads, one by one. The bigger ones will have thicker membranes, or ribs, down the middle. Shave them down with a knife to facilitate rolling. Add cabbage pieces and stems to pans. Add remaining 3 onions. You can also add additional fresh shredded cabbage to the pans, if your family, like mine, likes the cabbage pieces. Place one heaping tablespoon of filling onto the center of each cabbage leaf. Roll the leaf around filling, tucking in the sides to secure. Fit filled rolls snugly into roasting pan over diced onions and cabbage. Prepare the sauce: Combine tomato sauce, duck sauce, brown sugar and chicken soup mix. Spread over cabbage rolls in each pan. The sauce will be thick. While cooking, the cabbage will release more liquid and the sauce will become gravy. Cover pans; bake for 2 1/2 hours. Remove from oven; add lemon juice to the sauce (taste and add more lemon juice if you prefer it more tangy). Return to oven for additional 1 1/2 hours. Stuffed cabbage freezes very well—raw, baked, or half-baked. Note from Renee Muller: The smaller leaves yield the prettiest cabbage rolls. What to do with the larger leaves? You can rip them apart at the center by the membrane and use them for two rolls. Use the membrane as one edge and roll into a mini triangle, tucking in one side only. Or shred and add to the pan. I will love to try the muffins; Just what type of tea we need? What temperature do you bake the stuffed cabbage? I have the cookbook and it doesn’t the temperature in their either. Let me find out, I’ll get back to you! Oven temperature should be 350. Let me know how the dish turns out! How can I make my own chicken soup mix? I prefer not to use mixes.